Cedarwood has been used for over 5,000 years for many good reasons. The ancient Sumerians as well as the Egyptians believed cedarwood could connect the body with the mind in rituals and ceremonies. The Egyptians also believed that the body should be embalmed in cedarwood so the journey to the other side was a smooth transition. Scripture writers tell stories about Solomon and his love for cedarwood. He built his temple and palace from the Cedars of Lebanon, which made him the wisest man on the planet. Cedar was a symbol for strength, connection, and protection in those ancient days. 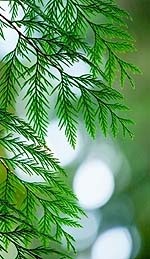 Cedarwood oil continues to attract people who want to connect with the soul-consciousness in this physical plane, and it is also used as an insect repellant and a bacteria preventative. Cedarwood essential oil is fantastic for breaking down cellulite and is one of the most popular oils used for deep massages. And the therapeutic qualities of cedarwood oil don’t stop there. This aromatherapy oil is effective for hair loss, acne, psoriasis, urinary tract infections, and bronchitis. Attention deficit disorder and compulsive behavior can be treated with cedarwood oil, and it reduces the risk of hardening of the arteries. Cedarwood stimulates the pineal gland, which releases melatonin and promotes deep sleep. The pineal gland also open channels to the innate capacities that we have which have become buried under the myth of separation propagated by modern society. The Sumerians discovered the awakening potential of cedarwood long ago, and cultures around the world hold cedar sacred and use it as a beneficial, clarifying teacher plant. The most wonderful benefit of using this essential oil on a regular basis is the emotional and spiritual transformation that develops as the plant is incorporated into one’s practice. The therapeutic properties of this amazing oil are astringent, antiseborrhoeic, diuretic, antiseptic, antispasmodic, tonic, fungicide, insecticide, sedative, emmenagogue, and expectorant. The oil also sedates the skin, which relieves itching, and it acts as a general tonic, which helps control acne, dandruff, and oily skin. In vapor therapy cedarwood essential oil can be used to relieve arthritis, rheumatism, and respiratory issues. The oil can be massaged into the skin or diluted in a bath to relieve painful joints, cystitis, and catarrh. When cedarwood is blended with other essential oils such as cinnamon, bergamot, frankincense, juniper, benzoin, cypress, rosemary, jasmine, lavender, neroli, rose, and lemon, the results are better than expected, especially when cellulite and muscle pain cause unnecessary stress on the body. Ancient civilizations knew the importance of using cedarwood, especially when the body was in a state of distress. The physical and mental connection that humans have with cedarwood oil is so special that it can’t be taken for granted. The old remedies are new again and cedarwood oil tops the list when it comes to bringing the body and mind together in an innate as well as objective way. This entry was posted in Essential Oils on November 13, 2010 by Keith Cleversley.